It's that time again - Indie Spotlight time! I love celebrating and supporting independent designers. And this time, it's the turn of marvelleous hat missy - The Libertarian. I met the founder and designer behind The Libertarian, the beautiful Jayne Elwell, at Newcastle's Vintage Clothing Kilo Sale. Usually I've seen her doing the rounds at The Affordable Vintage Fashion Fair, so it was nice to be able to chat to her as I restocked and she took the money at the front, and stamped visitor's hands. She told me how she used to design clothes and accessories, but has recently begun to focus on hat and headwear design. This does include fascinators and hairbands (two of my favourite things in the world). Now I'm not going to lie - I'm not usually a hat person. Beyond berets, I don't think I really suit wearing hats. But when I clicked the link to Jayne's online shop I was instantly in love! Everything is inspired by classic vintage designs, but still have modern twists - such as using swarovski crystals for that extra sparkle. Just clicking through the collections - which includes bridal wear - you can see the sheer creativity shining through, that you just don't get with mass produced items. Everything has been carefully put together with the highest quality materials. 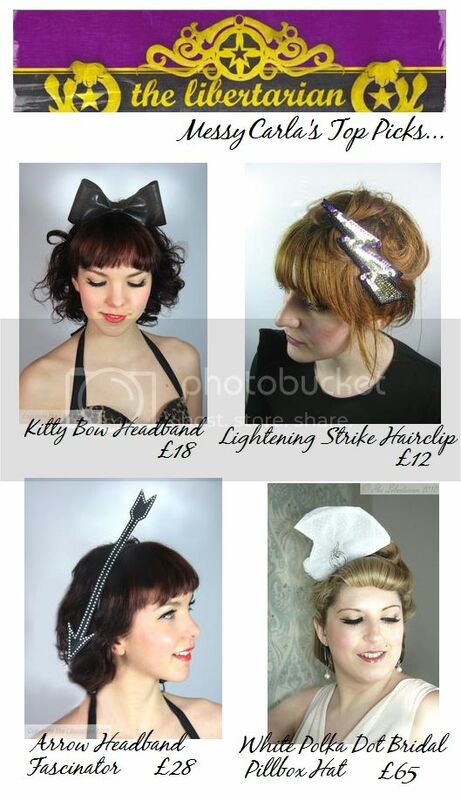 The prices are very reasonable I think too - with mini fascinators starting at just £12. 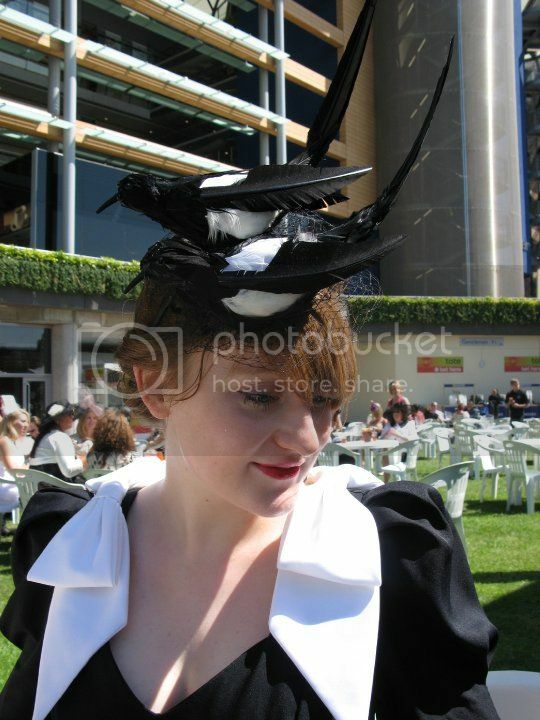 It was inspired by the Victorian fashion of ladies wearing wearing real birds on their heads. But of course these aren't real magpies - they were created completely by scratch, and they even have swarovski crystals for eyes! I love that she made two magpies too - just like the saying "One for sorrow, two for joy." As usual, I'm going to post my top picks from the entire collection. It was so difficult to just pick four! You're all in love now, right? Finally, Jayne was kind enough to made me a one-off fascinator to try for myself. She asked me what sort of colour scheme and style I would like - and I requested something black and silver to go with my red hair. Fitted with a small clip at the back so it can be fixed to my head easily. 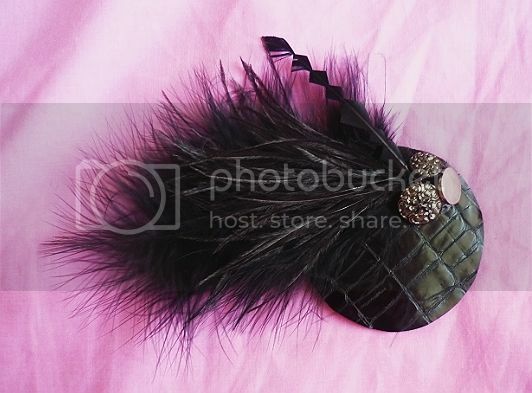 These mini fascinators are priced between just £8-£12 depending on what you request, are made with real leather and a selection of feathers and other adornments. Lots of colours and styles are available - just ask! And just for you guys - for a month, you can get 10% off all items from The Libertarian by using the code MESSYCARLACODE at the checkout. If you do buy something - do let me know what you've picked, and what you think! So please consider supporting Jayne and The Libertarian - she's not only incredibly talented, but also very sweet. Be sure to check out everyone else who has been featured on the Indie Spotlight. If you know of a company, or are a company who would like to be considered - please get in touch! MAGPIES. ON A HAT. OH MY GOD. It totally needed the capital letters. This girl is brilliant. oh my gosh! thanky ou so much for spotlighting these awesome, beautiful hats and headbands! bookmarked for payday!! Jenjar: I love it too :) So unusual to have a bow hairband on the top of the head - I love it, very Snow White! pearlslaceandruffles: I know, I love everything! I had to look twice at the name & photos - I went to school with Jayne! Outfit Post: Old and New! Mid Week Nails: Berry Ice Cream. Back from New York City!